5) Ephesto, Luciferno, Pólvora b Blue Panther Jr., Guerrero Maya Jr., Stuka Jr. This was a show. Audaz is pretty good. They’re very focused on the Angel de Oro/Cuatrero thing and not much else. Kobayshi’s CMLL debut. Kaho took falls 1/3. 3) Difunto, Misterioso Jr., Virus b Esfinge, Rey Cometa, Star Jr.
Star Jr. replaced Drone on Saturday. Difunto replaced Sagrado on Tuesday. Rudos took 1/3. CMLL will hold a press conference a week from today to announce details for this year’s Homenaje a Dos Leyendas. CMLL hasn’t really begun to hint at a match that’ll be the main event of the second biggest show on CMLL’s calendar, unless the Angel de Oro/Cuatrero feud is meant to be a much bigger deal than anyone understand at the moment. This is much earlier than usual to announce these things, so perhaps the announcement will be limited just to the date and to the identity of the luchador who will be honored along side of CMLL founder Salvador Lutteroth, with no matches announced yet. There’s no real hint about who might be honored this year either. CMLL announced a new TV deal yesterday. First thing first: if you’re reading this, you probably don’t need to go out of your way to see CMLL’s TV in general. Anything CMLL is recording for TV is also streamed online and ends up on their YouTube channel at this point. TV has names under the wrestlers which makes it easier to get up to speed and may have extra interviews, but you’re already getting the same matches. This is more of the people who, for some reason, have better things to do than go on YouTube looking thru two hour video streams for the one match they actually want to see. Anyway, CMLL announced they’ll be back on Teleformula starting on February 11th. They’ll air Sundays at 1pm. There’s no mention of which matches will end up airing. Teleformula is a cable channel in both Mexico and the US, though it’s not carried by every cable/satellite system in the US and usually locked away on a Spanish-language only package. Teleformula is on most systems in Mexico, so this gives CMLL something along the same level of visibility as AAA’s shows on the TDN cable channel (though TDN also repeats AAA’s show multiples as week and airs Zona Ruda.) It’s an improvement to CMLL’s TV picture but shouldn’t be expected to have a big affect on their business. Teleformula previously aired CMLL matches from Guadalajara from 2010-2011, and matches from IWRG the year before that. The IWRG shows were notorious for showing the same episodes over and over again. It was a bit better when CMLL had the slot. That’s a long time ago now so maybe it won’t feel like the network has lucha libre on just to occupy a time slot this time around. AAA held a press conference in Puebla to promote the Rey de Reyes show. The key message was Fantasma/Texano was going to be big, and AAA running in the new Acropolis building means it’ll be their biggest show in the city ever. They’re suggested they might reach 10,000 for this show. Vampiro says he’s to be booked in the undercard. There will be a Rey de Reyes tournament on the show, though they didn’t offer any specifics on how it’ll work this year. They’re trying to push this as the best AAA show ever outside of Mexico City. That’s debatable at best, but makes sense as a marketing concept when you’er trying to get more people coming to your show in this town then you’ve ever had before. FREEDOMS announced Kenji Fukimoto will be coming to DTU from March 15th-17th. He’ll challenge Violento Jack for the FREEDOMS title on the 17th in Tulancingo, and also be part of not yet announced shows in Xalapa & Cuernavaca on the other two days. +LuchaTV’s podcast has Los Reyes del Biutiful as guests. It looks like there’s a show in Morelia focused on hearing impaired wrestlers this weekend. 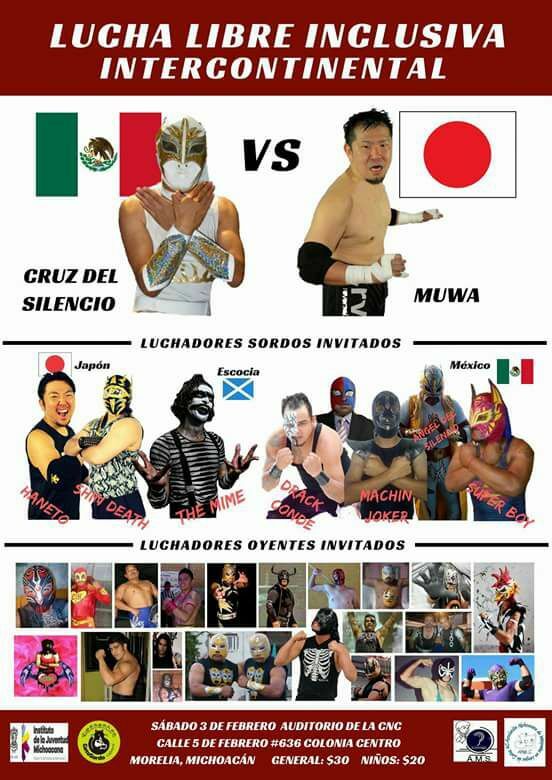 It looks like Cruz del Silencio is running it, in part to celebrate 10 years of being a luchador. It’s peculiar for Esfinge & Triton to be working this show, and the Sinaloa guys being in means they’re setting up something. Main event should be more Atlantis/UG, with incredible sides to avoid Rush & Pierroth being opponents. Astro is fun when he turns up here. The opener is Sauron’s first known match since December 2016.
https://www.youtube.com/watch?v=FvcEj2VZo48 highlights of Kaho’s first match which hopefully airs.